…and then, in June 2015, we woke up one morning to tweets galore. Our little favourite corner of Istanbul had been demolished over night. Gone! To say we were shocked and genuinely saddened – wow, that’s an understatement. 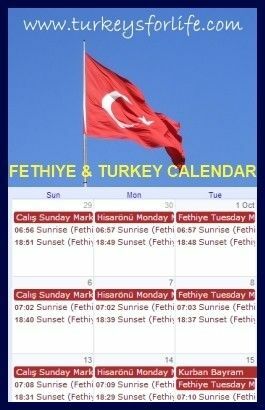 Many of the folks of Istanbul knew this was in the offing but we’re tucked down here in our own little corner of Turkey; Fethiye. We weren’t prepared. Just a few weeks before, we’d been staying in Galata and sat at one of those eateries in the spring sunshine with Anıl of Foxnomad; the waters of the Golden Horn slapping against the shore, seagulls eyeing our food. Apparently, most of these eateries were unlicensed (illegal) and they had been given notice that their days were numbered. The problem was, they’d been there so long, they’d become an institution. Hence the shock felt by many. 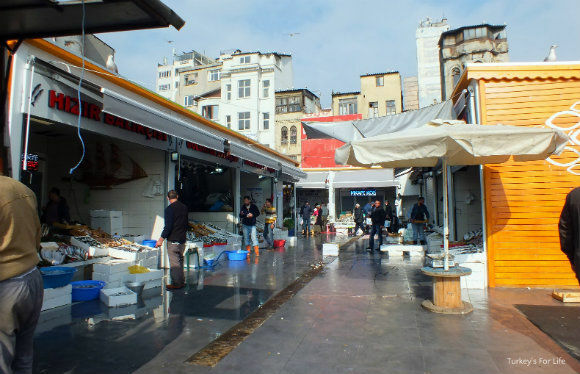 And then, on studying photos of the demolition by Istanbul-based bloggers and online newspapers, we soon worked out that not just the eateries but the whole Karaköy fish market was gone, too! Just disbelief! 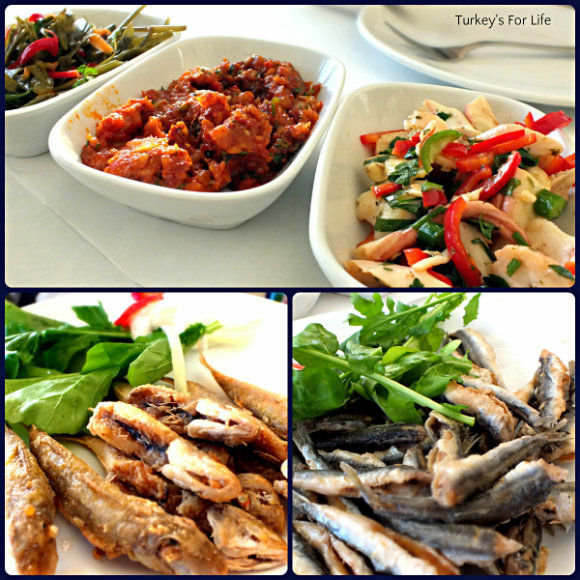 We wondered how we’d feel when we saw the scene for ourselves when we returned to Istanbul in November…and where we’d go to eat hamsi ekmek! 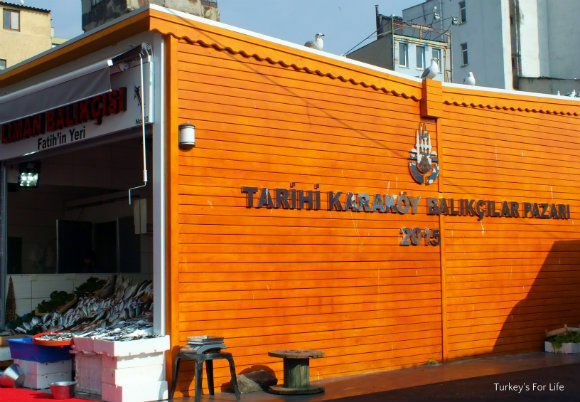 “Tarihi Karaköy Balıkçılar Pazarı” means, “Historic Karaköy Fishmongers’ Market.” We guess it’s historic because fish mongers have traded from this site for some years…it just doesn’t look too historic at the moment with its brand new, tiled units, clad in freshly varnished wood and a big shiny ‘2015.’ It reminds us of a shop that used to sell ‘Modern Antiques’ in Fethiye. But it’s a big phew from us for these fish market traders. We thought we’d be going to see a vast empty space where once a vibrant market had stood. Another of the world’s markets gone forever. But, happily, fish is still being sold from this spot and it’s being sold from purpose-built units, too. It’s neat and organised, the fishmongers have their names over the tops of their units. Better in bad weather? Most probably. It’s not rickety and ramshackle – an atmosphere we’ll miss – but trade continues and it would be nice to think the fishmongers are happier and better equipped in this set up than the previous one. So, from appearances, all well and good on that score. Let’s hope it’s well supported. But it was this area where we used to come for our favourite hamsi ekmek – steam rising from a huge tantuni pan into the autumn air as the anchovies sizzled in the deep, hot oil. That’s gone…but on another wander around the area, we headed a little further along the shore of the Golden Horn, just past the Karaköy Fish Market, to where the seafood cafes once stood. 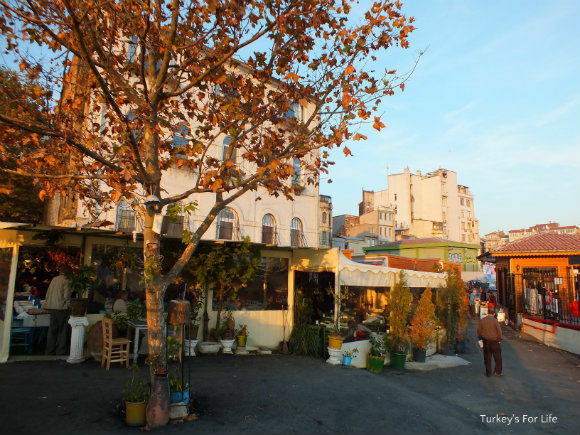 Walk through Karaköy Balıkçılar Pazarı, passing the Karaköy ferry terminal and you’ll come across Akın Balık. We were so happy to see that one of these restaurants had lived to tell the tale – Akın Balık is there, legally, we guess. 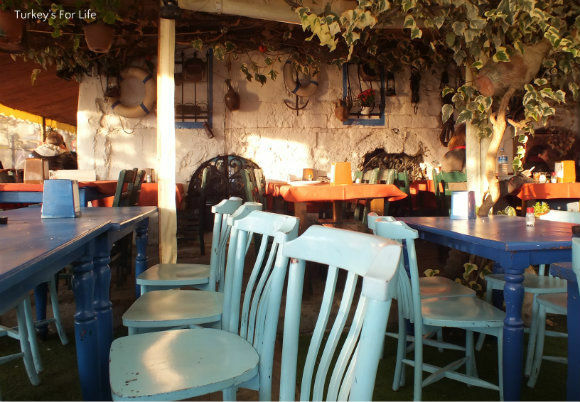 Multi-coloured plant pots and wooden chairs, blue-painted tables, plastic covering sheltering diners from the breezes and cold autumn air, Akın Balık is a lokanta specialising in meze and seafood. 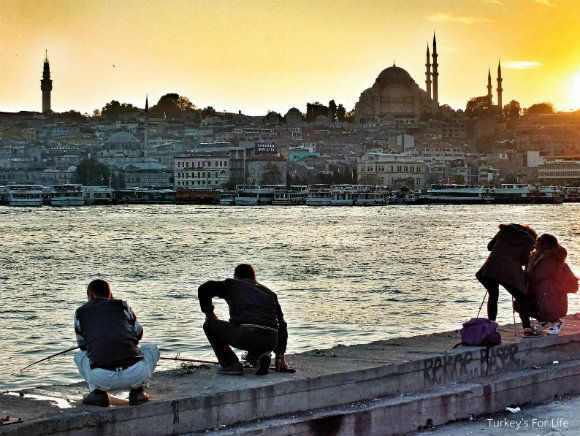 Ahh, to be thankful for small mercies – we still get to eat hamsi by the Golden Horn in winter! Apparently, Akın Balık gets packed out in the evenings, especially at weekends, but we were there late afternoon; the low autumnal sunshine casting dappled lighting around the dining area. This is a lokanta so there is no menu. We wandered inside and the waiter lead us around the back to choose what we wanted from the meze fridges. You know us, when we see us a selection of foods on display. Some of that, some of that, a bit of that…and before we know it, we’ve got a table full of food and just the two of us to eat it. We eat quite often in Istanbul so we managed to be quite sensible on this occasion. An obligatory (for us) meze of Antep Ezmesi – and then it just wouldn’t have been right to have other non-seafood meze. Kaya Otu (a rock seaweed) and then a little treat… Mmm, if we see octopus in any form, we’ve gotta order it. This time, it was an octopus salad. There was a variety of choice for main courses and the waiter was rhyming off all manner of fish and seafood to try and tempt us. He could have stood there all night with his sales patter but it wouldn’t have made a scrap of difference for me. How can we not want to spend time eating simple seafood dishes by the water with a view like this? 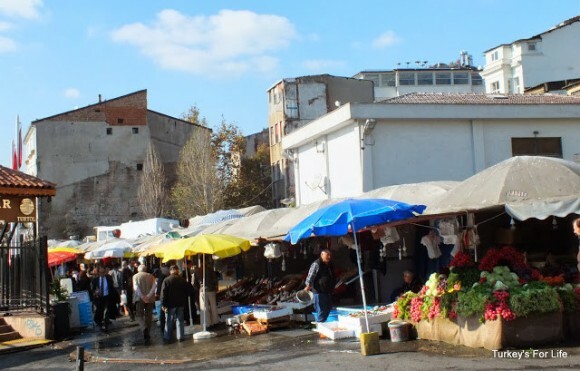 The cafes might be gone and the atmosphere has definitely changed; but Akın Balık is still there. Rumours abound as to what the now empty space by Akın Balık will be – time will show us that one – but, for now, Karaköy Fish Market still sells fish and seafood to shoppers (thankfully) and those who are hungry can take their pick of places to eat. For good simple seafood at decent prices, Akın Balık is no bad choice – we’ll definitely be back, that’s for certain – and as we left to walk back through the neat and shiny new Karaköy Fish Market, there were three manned barbecues packed with sizzling mackerel all ready to sell balık ekmek to people getting off the ferries. . . with so much of Istanbul being gutted it’s great to (re)discover some of the survivors. Yeah, we thought we’d said goodbye to Karaköy fish market and all of the lokantas, to be honest, Alan so it was great to see Akın Balık still knocking around, too. Thankful for small mercies but wish this constant sterilisation of charismatic places would let up a bit.